Frank Ribery have vowed never to speak with Bayern Munich team mate Jerome Boateng after being drenched with beer by the Ghanian born Germany International. This happened as Byern Munich, the newly crowned Bundesliga champions were celebrating winning the league. Ribery, a Muslim, had told players to keep the alcohol away from him as they celebrated on the pitch after the game. It seems some didn't quite get the message. The Frenchman was chased around the pitch before Boateng got to him and dunked a huge glass of beer over his head. 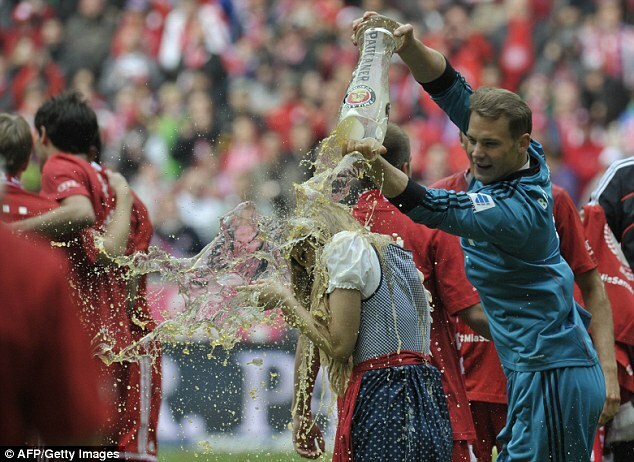 Goalkeeper Manuel Neuer also got in on the act as he cheekily threw beer on one of the girls on the pitch. The unsuspecting lady ended up with the same fate as Ribery, with Neuer wheeling away in celebration. As well as qualifying for the Champions League final, Bayern have wrapped up the Bundesliga title with ease, 22 points ahead of rivals Borussia Dortmund, and after their 3-0 win over Augsburg the champagne started to flow.